FANBOY PLANET.com . : rb-LoopinChewie :. It says ages 4 and up... and up is the active word there! Today, the internet went slightly insane when the following image appeared, showing a somewhat crazed looking Chewbacca sticking out of a Millenium Falcon apparently attacking a couple of the Empire's discs while a hand works a leever in defense! At this point, you're likely saying "What?" Hold on, there's some good madness coming your way. 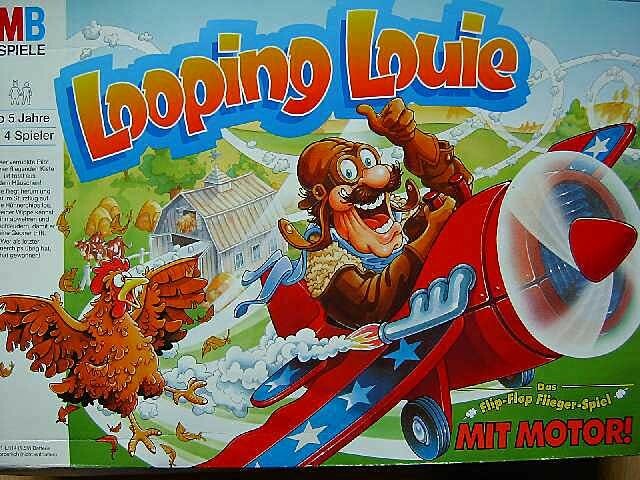 Loopin' Chewie is the latest in a history of game variants based on Loopin Louie, a smash hit from the early 90's. Originally from Milton Bradley in Germany, many copies made their ways overseas via expensive imports until finally getting local production and literally world-wide editions have been published. The game is simple. There's a motor in the middle that swings an arm around with Louie, or Chewie, at the end. The plane or Falcon can spin freely at its end, and the base of the arm is counerweighted so that it bobs up and down easily. 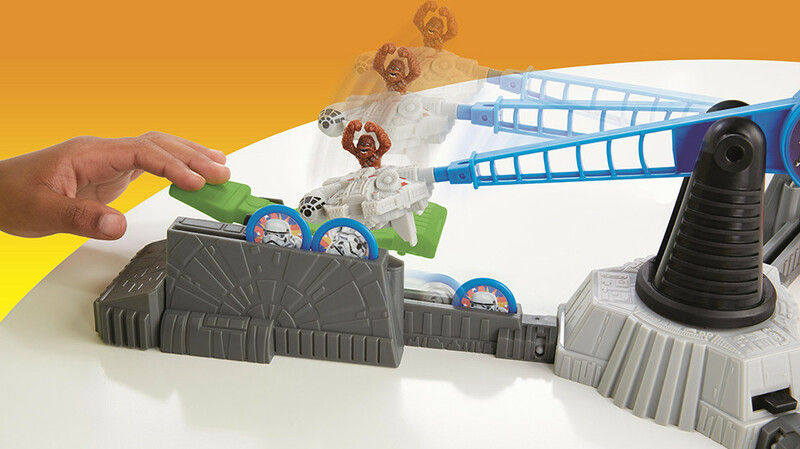 Players use paddles to slap the flying menace away from their chicken or Stormtroopers, which would otherwise be knocked off their perch through collisions with the spinning craft. The last player with discs still on their perch is the winner. Here's an original televison commercial that goes a long ways towards explaining the game. 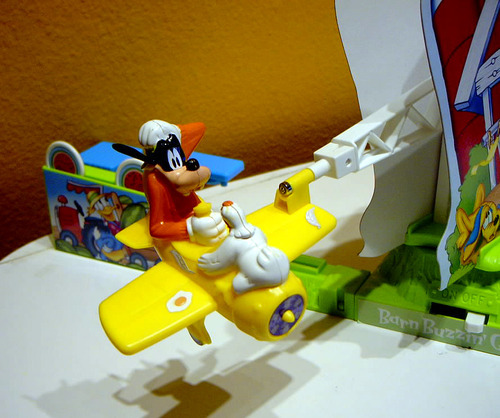 There was even a Disney version in 1999 featuring Barn Bustin' Goofy! What's not obvious at first is that this is really not a kids' game. Sure, kids can play it, but they don't have the real appreciation of what an amazing balance between strategy and physics this game really is. For many years the European-Only availability of the game made this a popular "Grail Game" among Board Game Geeks, arguably an adult audience. And it inspired many do it yourselfers to create their own versions. There are many "large scale replicas" around, albeit mostly in Germany. Yes, the game is insanely popular! We should note that a Star Wars themed version is nothing new at all. Recently, Toys R Us had a $24 sale on the game, leaving inspired gamers an opportunity to employ their own creativity in rebranding. This version by Board Game Geek member Christian Busch (Space Monkey Mafia) was posted in April of 2014, long before Hasbro had made its announcement. 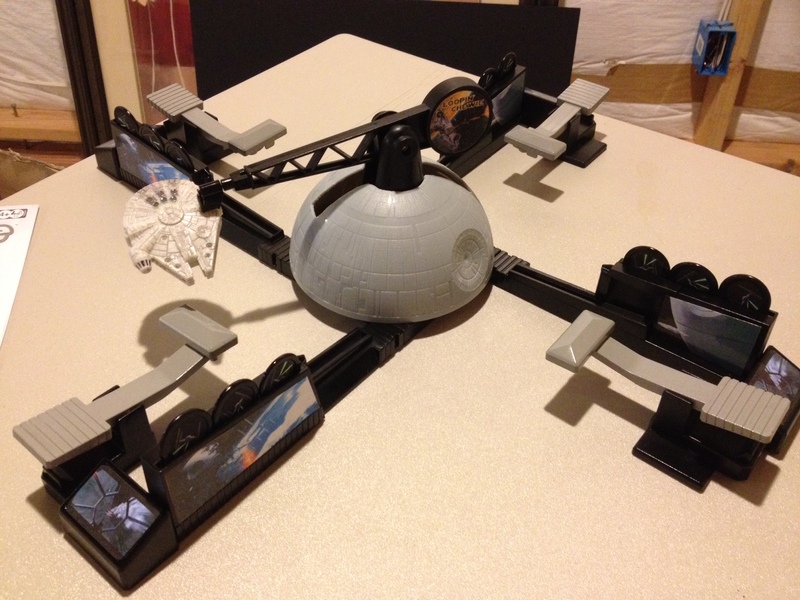 In an amazing bit of foresight, the DIY version was even called Loopin' Chewie! The Force is surely strong with the Space Monkey Mafia. Still, the official Loopin' Chewie is sure to be a hit, with kids of all ages. (But mostly adults.) It has one additional surpise bonus for those of us who already own one or more Louies: it's set for three players instead of the typical four, making it the go-to dexterity game for a cozy trio of gamers. We'll be on the preorder list, likely sometime in September, and we'll be sure to let you know when you can too! Ric Bretschneider is the author of Fanboy Planet's "Digital Fanboy" and "Fanboy on Kickstarter" columns, as well as being an insanely prolific board gamer. 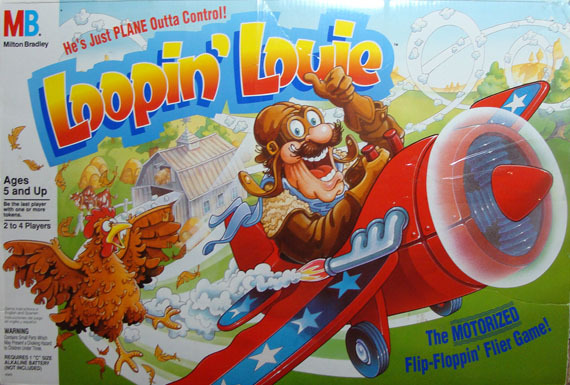 He is also two-time Loopin' Louie champion at West Coast Meeplefest invitational conference. So yeah, he knows his stuff here.